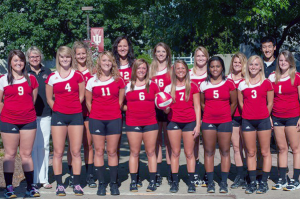 2012 IU Kokomo volleyball squad. KOKOMO, Ind. – After an inaugural 2011 season that was constructed at the last minute and had little collegiate playing experience, the 2012 IU Kokomo women’s volleyball squad is ready to take the court with a new attitude. Last year the squad played at the club level; this year they are a full-fledged NAIA program. Eight newcomers will join five Lady Cougars returning to defend the Kokomo net. Snoddy said the play on the court will be much better this year. And she emphasized that is not a knock on last year’s squad – it is a result of gaining and recruiting experience. One year ago, Rachel Williams was the only player on the team with experience, having played at Goshen College. She ruled the court as the setter and is expected to be a team leader once again – albeit with at least four other 2011 teammates with similar experience. Joining Williams from last year’s squad are sophomores Emily West, Lael Burrus, Shelby Spall and junior Krista Armstrong. West is a back row player from Peru High School and is considered the strongest player on the team. She will be relied upon to be a team leader. Armstrong is a junior from Maconaquah who will continue to play a variety of positions for the Lady Cougar volleyball squad. Spall, a Western graduate, played outside hitter last season and attacks the nets strongly. One senior transferred to the IUK program this season. Heather Tolson joined the team during the 2012 spring season after previously playing two years at Kankakee Community College and one year at West Liberty University. Tolson, at 5-11, is unique because she is a setter who can hit and block. Snoddy said she brings a real presence to the net. A pair of Chargers transferred to IUK. Miranda Hammons and Carlee Davis both played at two-year Ancilla College a year ago. Hammons has “a very high volleyball IQ” and is a defensively solid back row player. Snoddy said Davis is a “versatile athlete” who can play many positions for the Lady Cougars. LeAnn Cook was a late signee for Coach Snoddy who should make an impact on the squad. Brooke Mathias currently has an injury and will not be ready to play at the beginning of the season. Snoddy said she will be a back row player for IUK. Three freshmen decided to play collegiately in the City of Firsts, including Megan Riley from New Palestine High School. Snoddy said Riley was the first signee of the 2012 recruiting class. Setter Cortney Hanson comes from a strong volleyball program at Pioneer High School. The volleyball squad found a new home court this season. Last year, Northwestern High School stepped up and allowed the program to launch its campaign at the home of the Purple Tigers. This season, IUK will use Maple Crest Middle School, which is located across the street from the campus. The season starts on Aug. 21 with a 7 p.m. home game against Purdue University-North Central. Five other home games dot the 24 game schedule for the Lady Cougars: Purdue University Calumet, IU Northwest, Vincennes, Anderson University and ABAC. On Aug. 24, the Lady Cougars hit the road for the first time as they travel to the Kickoff Tournament at the Illinois Institute of Technology. The season ends with nine of the last twelve matches on the road with the last match on Nov. 2 at Goshen College. KOKOMO, Ind. – IU Kokomo volleyball coach Kristen Snoddy said before the season that her Lady Cougars would be vastly improved compared to the programs inaugural season one year ago. And while the Cougars lost its first-ever NAIA game to Purdue University-North Central in straight sets (25-22, 25-23, 28-26), the coach was pleased with many phases of her squads’ game. In front of hundreds of IUK fans, and one year removed from playing as a club program, the Lady Cougars showed the NAIA world they were ready for the move up. And the Panthers of PNC took note of an improved program. Several times in all three sets, the visitors from LaPorte County found themselves trailing. But each time, the Panthers rose to the occasion and took the set win. Coach Snoddy said that is something her team will need to learn to do. In the first set, Kokomo jumped out to an early 3-0 lead, and held a 10-6 advantage after an ace by sophomore Emily West (Peru, Ind./Peru). A block by freshman Megan Riley (New Palestine, Ind./New Palestine) gave the Lady Cougars an 11-7 lead. PNC tied the set at 15, then IUK regained a 17-15 lead as West served and the Panthers made a pair of errors, but the Panthers took an 18-21 lead following three consecutive IUK errors. Freshman Rachel Allen (Lizton, Ind./Tri-West) tried to rally the Cougars on a pair of kills to cut the lead to 22-24, but it was too little, too late and PNC took set one 25-22. An exciting second set included 15 ties and six lead changes with neither team holding a lead larger than two points. With the score tied at 17, the Panthers fired two straight kills to take a two point lead. But West came back with two strong kills sandwiched around a kill by Shelby Spall (Kokomo, Ind./Western) and the Cougars regained the lead. Spall, coming off a case of bronchitis, tied the set at 22 with another kill, and after a pair of PNC points, IUK recorded a team block at the net to cut the lead to 23-24. But once again, PNC was able to score the final point for a two set lead. The third set ended in heartbreak for the Cougars. A strong start saw the home team take a quick 3-1 lead thanks to kills by Allen, Spall and Krista Armstrong (Bunker Hill, Ind./Maconaquah). A PNC blocking error gave the Cougars a 10-4 lead, and after another Spall kill the Panthers hurt themselves with an illegal formation call and an illegal substitution penalty – and IUK seemed to be rolling with a comfortable 14-7 lead. Five IUK errors allowed the Panthers to cut the lead to 20-16, but with Hanson (Winamac, Ind./Pioneer) serving, PNC committed three errors of its own to stretch the Cougars lead to 23-19. A kill from Allen put the Cougars within a service point of the third set win (24-20), but three IUK misses and a PNC block tied the contest at 24. With the Cougars reeling, the Panthers scored a 28-26 set win to seal the match victory. The Lady Cougars return home on Aug. 28 for a 7 p.m. contest against Purdue University Calumet at the new home of the Lady Cougars – Maple Crest Middle School (located across from the IU Kokomo campus). This entry was posted in Cougars, IU Kokomo, IUK, NAIA, Volleyball. Bookmark the permalink.